I’ve had potential customers ask me about making QR codes. They have been getting a lot of buzz lately, even in the local newspaper. Here is an article in the St. Louis Post Dispatch about them. 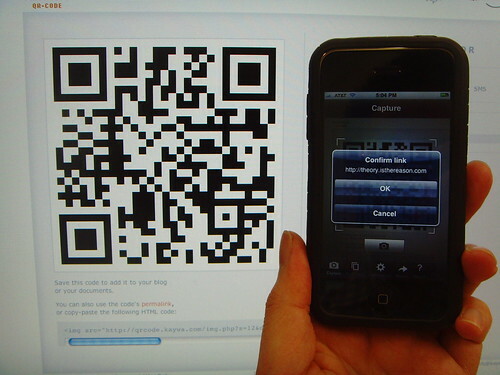 The first time I was asked about QR codes, I honestly didn’t really know what they were. Then when I was shown one, I immediately replied “yeah, I can make that”. This is because I noticed all QR codes do is send you to a url link. From a web developers viewpoint, all that is necessary is creating the webpage that you wish your QR code to take people to. That and going to one of the thousands of QR code generating sites out there. QR codes have a great use for advertising and specifically for sending people to video tutorials for a specific product. Say your business creates shelves but delivers it in parts to customers to put together on their own. QR codes could be used to send customers to a video tutorial on how to make the shelf they just purchased. Pretty neat in my opinion! Adding links through HTML is pretty straightforward. It is the simplest, useful HTML ‘coding’ out there. ‘<a href=”http://gpmwebsolutions.com”>Great Web Solutions</a>’. This would display the words ‘Great Web Solutions’ and link to the address indicated in the ‘href’ parameter. Here is a link to w3schools information about making anchor tags/links: W3Schools anchor tag information. Other useful parameters to define in the anchor tag are listed on that site. Below are the ones I find the most important. ‘target’ – This tells the link where to open. Defining this to ‘target=”blank”‘ tells the link to open in a new window. This keeps people on your site still if you are linking to another site. ‘rel’ – This is useful for telling search engines not to leave your site while crawling. If you define it to ‘rel=”nofollow”‘, then it will tell the search engine crawling bots to not leave your site when finding a link. This is important for helping your page rank. At the same time, when getting people to link to your site, it is important to make sure they don’t define this attribute (when doing a link exchange). Learning Computer Languages – Where do I go to learn computer languages? The internet is why. When I first started at my old job, they needed extra hands to do some HTML/CSS work. I didn’t have enough work to do, so I said to myself “Why not”. A co-worker there showed me a website, w3schools.com. If you want to learn computer languages, go there. Read through a tutorial. Read through it again. Then read through it again. The tutorial I would start with is the CSS and HTML stuff. I do think my analytical degree background and my extremely analytical brain are other reasons why I am so efficient and comfortable with web development. If you think you have a similar mindset and want to get involved in an excellent industry, read that site and feel free to email me questions at galin@gpmwebsolutions.com.